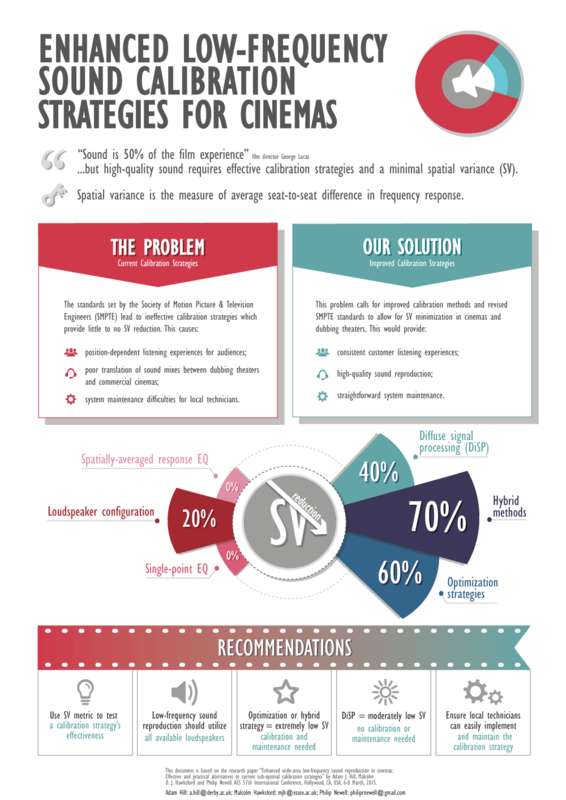 This paper explores strategies for achieving accurate wide-area low-frequency sound reproduction in cinemas. Current standards for B-Chain calibration call for single channel low-frequency equalisation aided by either single-point or spatially-averaged response measurements, an approach only applicable to a reasonably spatially invariant low-frequency response. A holistic approach to low-frequency coverage optimisation is presented exploiting subwoofer arrays, their positioning and multi-point signal processing. Acoustic-field examples are presented using finite-difference time-domain (FDTD) modelling software that expose a potential for superior wide-area signal reconstruction over that achieved using the current standards and recommendations. This research was summarised by Mihaela Gruia (@mihagruia) and graphic designed by Radina Metodieva.